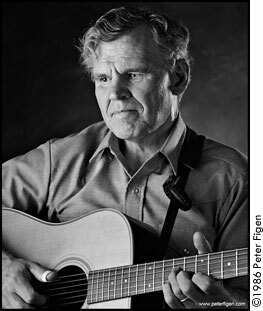 Doc Watson portrait taken in 1986. Doc's Guitar is dedicated to the guitar and music of Doc Watson. A master at both flatpicking and fingerstyle guitar, Doc's skills are legendary. Doc Watson had a profound influence in traditional, folk and bluegrass music ever since coming to national attention in the early 1960's. His recordings and performances have inspired generations of aspiring guitarists to explore the mysteries of his phenomenal playing. Here at Doc's Guitar you will find biographical information about Doc, along with a listing of the honors and awards he has received. We also feature a complete discography of Doc's recordings, as well as a listing of instruction books, instruction videos and performance videos. You'll also find our song search page that allows you to look up a tune and see a where you and find that tune in Doc's recordings, instruction books and videos. If you're looking for free tablature of tunes performed by Doc Watson, be sure to visit our free tab page. Our site has been updated since Doc passed away in 2012. This includes our Memory Book page, where you can share your thoughts, feelings and memories about Doc. So sit a spell, have a look around and enjoy yourself! This album was recorded live in 1997 concert at the Acoustic Stage in Hickory, NC. Doc is joined by David "Dawg" Grisman and with guitarist Jack Lawrence. Doc's grandson Richard also plays during the performance. The program includes tunes from the popular Doc & Dawg CD as well as previously unreleased tunes and two Dawg originals. This album was recorded live in 1964 at two college concerts: Purdue University on March 19; and the University of Illinois on March 20. These were solo concerts, so Doc's guitar picking and voice are clearly heard. The tracks from the Purdue show are newly released; they are not the same as those appearing on the Live At Purdue CD. This album was recorded live at a performance at Club 47 in Cambridge, MA on February 10, 1963. It occured at a pivotal time in Doc's early solo career. Following this show, Doc was booked at the 1963 Newport Folk Festival and released his debut solo album on Vanguard Records in 1964. We are affiliated with three online retailers at Doc's Guitar: Amazon, Sheet Music Plus and our Digital Video store. When you purchase products from our site, you're helping us offset the costs of keeping DocsGuitar.com online. Click here to learn more about our purchasing products from our website. ©2003-19, DocsGuitar.com. All rights reserved.